For President Francois Hollande - and indeed for the whole of France - it is a different world this week after the decision to go to war in Africa. The president has become a new kind of leader. 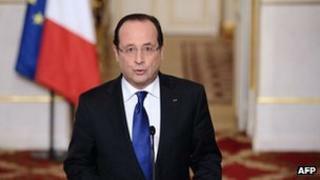 The abiding criticism of Mr Hollande has been that he is soft and overly consensual. But the rapidity of the move against the jihadists in Mali - and the green light to the failed rescue mission in Somalia - have revealed a man capable of bold and dangerous decisions. Not for the first time, foreign intervention has helped re-forge the image of a president who was floundering in the polls. And for France, it is a new world because the country is now engaged - effectively single-handedly - in a foreign conflict against the Islamists. The fallout from this is potentially enormous - from the risks of military mission creep, to the strategic repercussions on France's relations in Africa, to the very real threat of terrorist reprisals on hostages and in France. France has long-standing interests in, and knowledge of, this part of the world. It was the colonial power in Mali until 1960, and there are strong links of family and trade. France also has 3,500 troops stationed in neighbouring countries - part of the long-standing military commitment to French-speaking Africa that recent governments have actually been promising to scale back. Today, President Hollande has the backing of nearly all the political class, because in the main people buy his argument that the situation in Mali had become critical. The advance by the jihadist alliance, the French have been repeatedly told, threatened the survival of a friendly nation. If the Islamists took Mopti in central Mali, then in a few days they would have taken the capital Bamako. Then there would be a terrorist state a short plane hop from Paris. In an ideal world, the Malian army would have done its job and held off the advance. Or failing that, the UN-authorised West African coalition force would have been ready to react. But neither of these conditions held. So France's only option was to act. For a time, probably some days or weeks, there will be an automatic tendency to rally behind the flag and praise the president's new-found elan. But it is noticeable that already there are questions being asked about the purposes of Operation Serval, how its success will be judged, and how it will be brought to a close. From an initial task of turning back the advancing columns of jihadist trucks and 4x4s, the French have now turned their attention hundreds of kilometres to the north where they are bombarding training camps and ammunition depots. The clear aim is to weaken the Islamists' infrastructure to the point where they crumble in the face of a new advance from the south. But who is to lead this advance? The Malian army needs foreign help just to hold the line. The West African support force is supposed to be on its way, but will it be up to a major offensive? Or will French ground forces eventually have to be deployed to get the job done? Analysts say the fighting season will end in a couple of months, because after that the heat and the rains make combat impossible. So is the plan to have done with the jihadists by March? And what then? Mali is already a dysfunctional state. Since the army putsch a year ago, its politics are a mess. Will French forces one day come to be seen as propping up an unpopular regime, one that uses the constant bogey of Islamic extremism to justify its grip on power? None of this need happen of course. If luck is behind the French, then the jihadist alliance may prove a paper tiger. Its fighters may vanish back into the sands, and leave the towns back in government control. But no-one should be under the illusion that it will necessarily turn out that way. The French are glad to see their president has backbone. They believe what he did was right. But it's a new world. And it's full of danger.